OOOH I bouht the EA Active today.. need to shift the last half stone of baby weight (OK OK I actually lost all the baby weight and since then put on half a stone through chocolate and wine that I thought BFing would keep at bay!!) so fingers crossed once I get it out of the box it will work.. Will keep eye out for the yoghurts too! 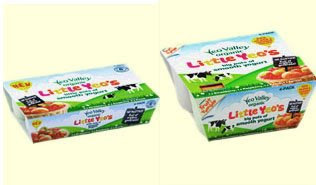 My two have always had Yeo yoghurts, we have some of these in the fridge to try!